You can't really count these as chicks. But, nonetheless, they are pretty damn cute. 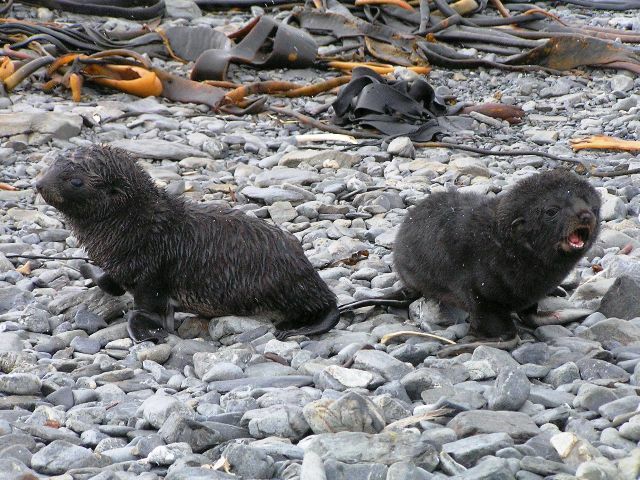 Antarctic Fur Seals are very territorial and aggressive, though. They bark and even charge at you sometimes. I got charged a bunch of times. I didn't carry a walking stick or anything like that. If a fur seal did charge, I'd have to lift my leg up so its snout would hit the sole of my boot. That was enough to stop it and have it back away. I saw this trick from one of the guides -- and I still got both feet. But the pups are just big puffs of fur. They try so hard to be fierce. It is completely endearing. You find yourself saying to them, "Yes, I'm terrified. You're doing such a fine job."